How to Activate your Webcam & Microphone? Be sure to maintain your privacy with use of headset. We’re 100% privacy advocate. We ask for no download, install and obtaining permission to enable your interactive devices. 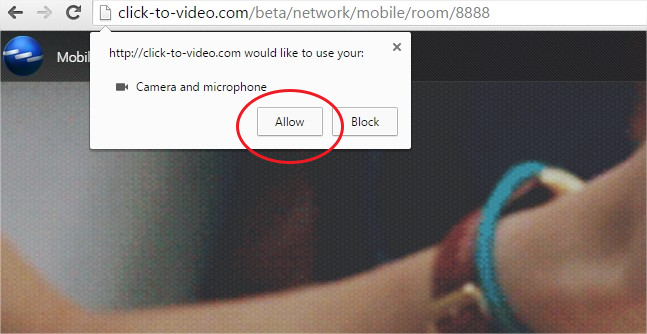 When you reach in the room, the browser asks you to allow or deny. Select allow to enable your webcam. To change the setting for webcam and microphone, on the right hand side of URL address line, you will see a webcam icon. Click and pull down. Change your camera and reload. Unlike Chrome, Firefox asks you first before allowing to share. 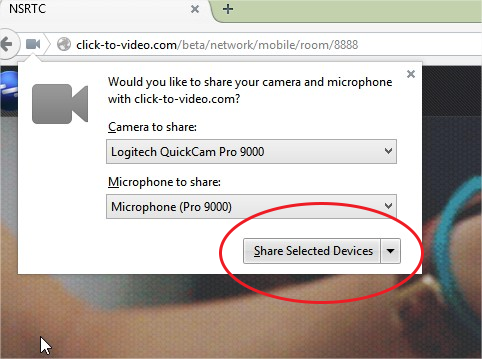 Simply choose your webcam and microphone and click on "Share Selected Devices". Note: Currently two browsers support NS RTC standards. Beta is tested on PC, MAC and Android with Chrome as recommended browser. Microsoft IE is discontinued and new Windows 10 with new browser will support the standards. Apple Safari does not support WebRTC standards due to FaceTime competition. We will be releasing an iPhone and iPad version. How to send invite and share? Copy and Paste URL to any web chat, online messenger, SMS text and or email. To send an invite or share the room online with your social media, simply invoke the green envelop button and follow the instructions. Simply refresh page. The best recommended way is to clear your browsing data. And then retry the link. You may also "Refresh" by pressing CTRL F5. Or use the Cyan button next to "X". Also see X, refresh page, and change template. Have fun and enjoy NS Real-Time Communications!